Humulene is one of the main terpenes in hops, from which it gets its name. Humulene is also called alpha-caryophyllene. 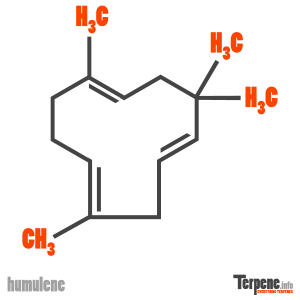 Like beta-caryophyllene, humulene is a cannabinoid and sesquiterpene, although it does not contain a cyclobutane ring. Humulene is a powerful anti-inflammatory and an anti-pain compound. It also has anti-cancer properties. Humulene is unique because, like THCv, it acts as an appetite suppressant, showing promise for weight loss treatments. The antibacterial activity of basal fir oil (Abies balsamea) seen to be effective with Staphylococcus aureus. At 2.6 microg/mL, humulene was shown to have a minimum inhibitory concentration, the most potent of all the terpenes evaluated in the study. Pichette A. Composition and antibacterial activity of Abies balsamea essential oil. Humulene was shown to be a good anti-inflammatory across a wide range of inflammatory markers. Its effects were comparable to dexamethasone in rat and mouse models. Humulene has been shown to have rapid onset and relatively good absorption with both oral and topical administration routes. In airway allergic inflammatory routes, humulene was shown to be effective orally or through aerosol. Chaves JS. Pharmacokinetics and tissue distribution of the sesquiterpene alpha-humulene in mice. Planta Med. 2008 Nov;74(14):1678-83. Fernandes ES. Anti-inflammatory effects of compounds alpha-humulene and (-)-trans-caryophyllene isolated from the essential oil of Cordia verbenacea. Eur J Pharmacol. 2007 Aug 27;569(3):228-36. Epub 2007 May 22. Alexandre P Rogerio. Preventive and therapeutic anti-inflammatory properties of the sesquiterpene α-humulene in experimental airways allergic inflammation. Br J Pharmacol. 2009 Oct; 158(4): 1074–1087. Humulene was elucidated to be potent against several solid tumor cell lines. The molecular mechanism involves producing reactive oxygen species, or free radicals, and depleting natural antioxidants in the cells. Humulene was also shown to work synergistically with beta-caryophyllene in delivering the molecule to cancer cells, thus increasing the cytotoxicity of humulene on several cancer cell lines. Legault J. Antitumor activity of balsam fir oil: production of reactive oxygen species induced by alpha-humulene as possible mechanism of action. Legault J. Potentiating effect of beta-caryophyllene on anticancer activity of alpha-humulene, isocaryophyllene and paclitaxel. J Pharm Pharmacol. 2007 Dec;59(12):1643-7. Tundis R. In vitro cytotoxic effects of Senecio stabianus Lacaita (Asteraceae) on human cancer cell lines. Humulene was shown to be toxic against early third-stage larvae of the malaria, dengue, and filariasis mosquito vectors, An. stephensi, Ae. aegypti, and Cx. Quinquefasciatus. Also humulene was proven to be a repellant to the adult mosquitos as well. In addition humulene was only toxic to non-pathogenic aquatic organisms, Diplonychus indicus and Gambusia affinis at much higher levels than those used against the mosquitos. Govindarajan M. Larvicidal and repellent potential of Zingiber nimmonii (J. Graham) Dalzell (Zingiberaceae) essential oil: an eco-friendly tool against malaria, dengue, and lymphatic filariasis mosquito vectors? Parasitol Res. 2016 Jan 21. LD50: Estimated to be 45 mg/kg, always consult your doctor before attempting to medicate yourself. Combustible liquid. Store in a well-ventilated place. Keep container tightly closed. Keep cool. Store locked up. Keep away from heat / sparks / open flames / hot surfaces. No smoking. In case of fire: Use dry sand, dry chemical or alcohol-resistant foam for extinction. Causes skin irritation. Causes serious eye irritation and may cause respiratory irritation. Avoid breathing dust / fume / gas / mist / vapors / spray. Wash skin thoroughly after handling. Use only outdoors or in a well-ventilated area. Wear protective gloves / protective clothing / eye protection / face protection. IF ON SKIN: Wash with plenty of soap and water. IF INHALED: Remove victim to fresh air and keep at rest in a position comfortable for breathing. IF IN EYES:Rinse cautiously with water for several minutes. Remove contact lenses, if present and easy to do. Continue rinsing. Call a POISON CENTER or doctor / physician if you feel unwell. If skin irritation occurs: Get medical advice / attention. If eye irritation persists: Get medical advice / attention. Take off contaminated clothing and wash before reuse. Dispose of contents / container to an approved waste disposal plant. Read through our forum on Humulene below, or start your own topic. This forum contains 673 topics, and was last updated by Lillysom 2 days, 23 hours ago.